This circa 1922 photographs shows part of Leon Weintraub's family in Bodzentyn, Poland. Standing, from left to right: Chana Weintraub (Leon's older sister), Leon Weintraub, and Dvorah Sztarkman Weintraub (Herschel's first wife). 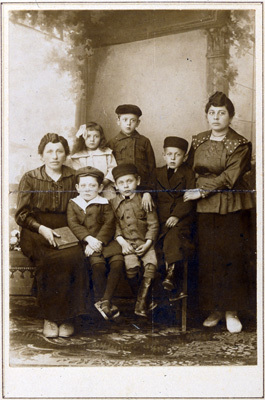 Sitting, from left to right: Dvorah's stepmother (unnamed), Fred Sztarkman (Leon's first cousin), Avraham Weintraub, and Sam Weintraub.